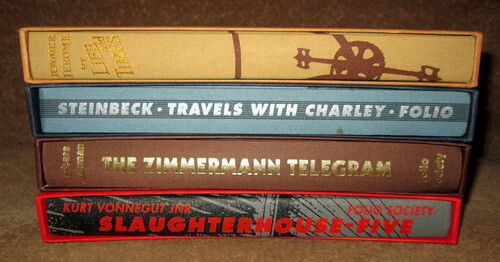 I love Folio Society Books, I used to be in the Folio Society (a glorified book club) so I have quite a lot of their editions, but I’ve also managed to buy quite a few at secondhand bookshops at reasonable prices. Sometimes they are priced beyond what I would pay for them but other times they are super cheap – too cheap really, it feels akin to theft, especially when it’s a charity shop. All you can do is pay the price and say – keep the change! When I saw these ones last week I just had to buy them, despite the fact that I already had 3 of them in cheap paperback editions. My Life and Times by Jerome K Jerome. I’ve read a few of Jerome’s humorous books and I’m looking forward to getting stuck into this one. Travels with Charley by John Steinbeck. I loved this one when I read it a few years ago. The Zimmermann Telegram by Barbara Tuchman. I haven’t read this one but Jack has. Slaughterhouse Five by Kurt Vonnegut. I read this one as a teenager, I should probably re-read it. I hadn’t read anything by Steinbeck since I was a teenager so when I saw that the Classics Circuit was doing a Steinbeck tour I thought it was about time that I rectified the matter. But what should I read? I didn’t have any unread Steinbecks in the house but on a visit to an Edinburgh charity bookshop the only book of his they had which I hadn’t read already was Travels with Charley so I took that as a sign. I hadn’t heard of the book but fellow bloggers all seemed to have loved it, and sure enough, I wasn’t disappointed. Steinbeck mentioned that like many men of his age he had had a bit of a health scare and had been in hospital the year before. Many men in his position opted to live a quiet cossetted life after that but he didn’t want to be a half-man who changed from being the head of the household to being the baby. He took it as a warning that it was later than he had thought and he should do what he had planned to do one day and take a road trip of America visiting places that he hadn’t seen before and revisiting old haunts. So instead of shifting down a gear he decided to step on the gas literally and the result is that he had a three-quarter-ton pick-up truck specially designed to his specifications with all the necessities of life, double bed, stove, fridge, lights worked from butane gas and a chemical toilet. In 1960 it was a thing of great interest to people wherever he travelled. He gave the truck the name of Rocinante after Don Quixote’s horse. He over-loaded poor Rocinante with tons of books, paper, water and all sorts of things which I’m sure he didn’t need. He obviously couldn’t travel light! For companionship he took Charley his large blue poodle, a very intelligent dog which was seen as an exotic in America and was a good social ice-breaker. Charley could also converse, well nearly. Ftt meant that he ‘wanted to salute a tree’ and Ftt Ftt Ftt meant that he was hungry! As I said, I really loved this book but for me it was too short. I would have liked more details. Things like how far he was actually travelling between various states and maybe a bit more in the way of descriptions of the scenery. It probably didn’t occur to him that such details would be of interest to someone sitting reading it in Scotland, or for that matter someone reading it 50 years after it was written. In Vermont he felt the need to look for a ‘John Knox’ church to worship in and he wasn’t disappointed. The congregation was subjected to a ‘glorious sermon, a fire-and-brimstone sermon’ I would say a proper Presbyterian you are all miserable sinners sermon. ‘Vermont God cared enough about me to go to a lot of trouble kicking the hell out of me’….. ‘I wasn’t a naughty child but a first-rate sinner, and I was going to catch it’ The sermon revived him in spirit and gave him a ‘lovely sense of evil-doing that lasted clear through till Tuesday.’ A couple of generations earlier J.M. Barrie wrote something very similar in his book The Little Minister which was set in the Highlands in the 1800s – it’s nice to see that Presbyterianism hadn’t suffered any dilution over the years. He does mention the mobile homes which were popping up everywhere and seemed to intrigue him and in Maine he was invited into one which he was very impressed with. They seemed to be inhabited by people who wanted to dodge paying taxes though and I think that their reputation is not what it once was. The people that he met along the way seemed to me to be very friendly, even the police/national guards were pleasant and helpful. The people in each state had different characteristics but it was the state and the people of Montana which gave him the most pleasure and in fact he said that if Montana had had a sea coast then he would have settled there but he had to live near the sea. He hadn’t visited Montana before. Visiting his old home of Salinas in California he realised that people from your past are best left in the past as everyone concerned prefers their own version of their memories and they tend to be different from what was the reality. Steinbeck says that in his journey each state had its own character, he was dreading going to the South because of the race problems there but he felt that he had to go. So he travelled to Louisiana to witness the ‘cheerleaders’ in action. They were a group of white women who chanted racist abuse at a young girl as she went to school. This was something which I didn’t know about and he doesn’t mention the name of the small black schoolgirl that they were abusing but it must have been Ruby Bridges I think and you can read about it here. I’m not sure if things are very much better down there now, but I hope so. Although John Steinbeck was a well known face in America he said that he was never once recognised. Some people have suggested that a lot of the book is in fact fiction, we’ll never know but, whatever it’s a very entertaining read. I haven’t read many travel books just R.L Stevenson’s Travels with a Donkey in the Cevennes, Boswell and Johnson’s Tour of Scotland and a book called Breaking Away which is about Coleridge’s tour of Scotland accompanied by William Wordsworth and Dorothy. It strikes me that although those journeys all took place in the 1800s, you can still visit the places that they went to and in fact people still do recreate the R.L. Stevenson journey, complete with donkey! I don’t know if it would be possible for anyone to do the same with this book as often the details of where he stopped for the night are quite sketchy and probably the places have been built over now, so probably there are no blue plaques in lay-bys saying: John Steinbeck and Charley slept here. At the end of the book I was so in tune with him that he seemed like a friend rather than a famous author. Anyway, I hope I’ve given you a wee flavour of what the book is like. I haven’t said much about Charley the blue standard poodle. What degree of dog is that? was the question that Steinbeck was always being asked. Charlie was a great companion dog and like most poodles was very smart. It’s just a shame that people often make them so daft looking with strange hair cuts. We used to have an apricot poodle – yes apricot! A big thank-you to Rebecca and Karen for putting in all the hard work to bring about the John Steinbeck Tour. Silly me! Of course I know it. This is just a quick wee reading update to say that I’ve finished reading Travels with Charley by John Steinbeck and I’ll be discussing it on the 20th of August for the Classics Circuit. The only thing I want to say about it at the moment is that at 238 pages it wasn’t nearly long enough for my liking! I’ve just signed up for the John Steinbeck Classics Circuit Tour and there’s still time to sign up if you want to. I read the more usual Steinbeck books, Grapes of Wrath and Cannery Row and such, when I was a teenager and I didn’t feel like revisiting them. So I’ve decided to go for a book which I hope will be completely different – Travels with Charley. It’s about his journey to rediscover America, accompanied by his French poodle Charley. I’ll be sharing my thoughts on the book sometime in August, I think.